If someone were to say to you "there aren't enough toys based on obscure minor 1990s Canadian indie rock band songs," well, you can tell them to go straight to hell! If no one told you, you'd never know that Scott Pilgrim was a comicbook movie (despite him fighting Superman and Captain America, and a cameo from the Punisher). Everything about it is much more firmly in the realm of videogames, but the fact is that it was a comic before it was anything else. 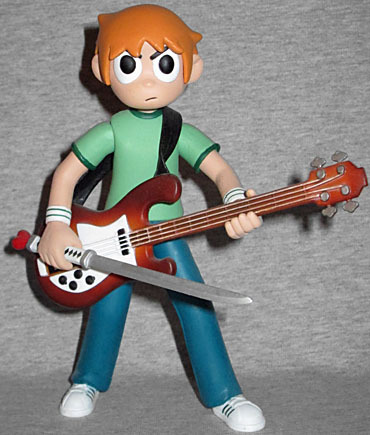 When Scott Pilgrim was turned into a movie, Mezco got the license to make toys - based on the comic. Which is probably a good choice, considering their particular skills, but it still seems a little bit like a missed opportunity. Mezco released two figures, and the only sculptural difference between them is the head. The face. One Scott is angry/determined, while the other is smiling. The smiling version doesn't look as good as the plain, but they both look just like the art. The pupils are sculpted, not just painted on, and the hair is a separate piece glued firmly on the head. Bryan Lee O'Malley has a very simple, clean artstyle, influenced mainly by Ranma ½, and the toy re-creates it nicely. There isn't very much detail to be found in the sculpt - only the broadest wrinkles and seams on his jeans, raised hems on his shirt sleeves, and blocky lines on his sneakers. Since the body on both figures is the same, it's just paint that sets them apart: Frowny is wearing a green shirt, while Smiley is wearing purple. The stripes on his shoes and wristbands are painted on, so they can get a little sloppy. One of the reasons we nominated Mezco's Breaking Bad toys for Worst of the Year was that they are 100% unarticulated lumps of plastic. Scott isn't quite that bad, but his articulation is definitely lacking. We're talking a balljointed head, swivel/hinge shoulders, then swivels at the biceps, wrists, and waist. Really? That's it? The kid is a fighter, and all he can really do is stand around in one or two poses? That's not enough. It's entirely possible to make a toy that's cartoony and still poseable, so this is disappointing. Even if they were going to skip out on leg joints, elbows and a balljointed waist would be huge helps. The figure comes with two accessories: his bass guitar, and the Power of Love. That's not a vague concept, by the way: it's the name of his sword. 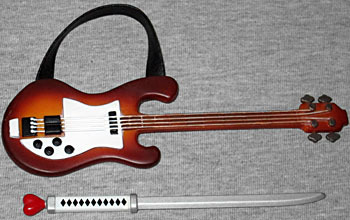 It's a katana with a black and white hilt, and a bright red heart on the pommel. His guitar is STBLDF a Rickenbacker 4003, painted brown and gold rather than the proper red. Surprisingly, it has a real leather (or at least "pleather") strap. Not too shabby! 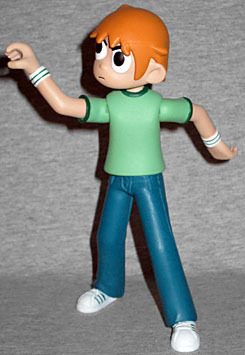 Scott Pilgrim's precious little action figure really isn't that good. It's got a great comic likeness, but the articulation is sub-par. Unfortunately, there's a lack of Scott Pilgrim merchandise, so this is the best you can hope for right now.